I built this computer for a group at a research institution. Both reasonable CPU and GPU computing power were needed. Money wasn't an issue. The primary goal of this system is to run a plane wave density functional code VASP. Since it will run 24/7 I particularly focused on quality, endurance, and performance. With GPU computing coming online as a major player and CUDA compilers being released for many languages I decided to add a Tesla K40 to the system. Otherwise the RAM and CPU are the main components of concern. I decided to only put in 64gb of DDR4 but the motherboard can support up to 512gb for further expansion. As for the CPU's I chose two Xeon E5-2630's. The machine has run now for months without any hiccups and the group I made it for seems pleased. As for the other parts I usually erred on the side of endurance and reliability. 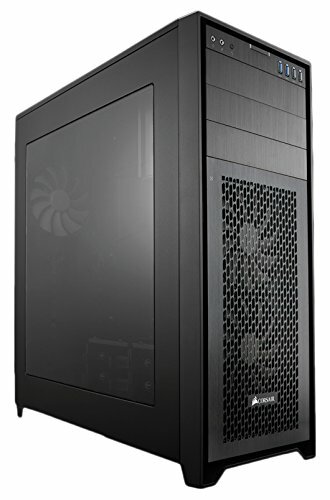 I chose Enterprise 2 Tb HDD's, a 256gb Samsung Pro, Phanteks large air CPU coolers, and the Corsair 750D Airflow edition case -- mainly for good looks and expandability. A Tesla K40 sli setup may be added in the future to add some computational gravitas. Since there is interest in an upgrade, I've been looking at a machine that possibly comprises of dual 22 cores and Nvidia's new Tesla P100. Although I'll probably wait for Intels new CPU's and Zen to come out first. I put two of these in a workstation system and they work well and have run for many months straight with a demanding computation load. A good PSU for systems that could/will take a lot of power. It has a 10 year warranty, so where reliability is concerned it checks that box as well. Decent and working CD Writer. My dude it's a meme, look up "But can it run crisis?". But i am pretty sure workstation cards can still run games https://www.youtube.com/watch?v=T_msbomKvVw But obviously it isn't designed to run games, but it still can and would be cool to see those benchmarks. It does research that uses very demanding applications. It puts a big smile on my face to see a workstation pc on here every once and a while. I thought about building one for the use of ANSYS Fluent CFD for my FSAE team at school. Would be like super expensive though. The primary goal of this system is to run a plane wave density functional code VASP. +1 from me. How is that cooler doing? Are you happy with the build now? They seem to like it? You don't that machine with you? The reason why I ask is that I'd like to drop all Water coolers in the next Workstation build batch. As of today, I've dropped Kaby Lake CPU in favor of Ryzen. How much clearance does the ram have? Id like to put a be quiet shadow rock lp cooler but I can't find any ram measurements online. cool build love the intel Xeon i'm having an 8 core xeon to!! where did you get the motherboard at? No ignore the noob comment you are fine. This is an awesome crunching machine. I saw the Tesla in your pictures and had that "Wow" moment. That's a lot of power. RAM is designed too operate optimal with the sticks within the same set adding another set later on isnt optimal: https://youtu.be/oRCXYXszi8U Says it at 3:20-3:40 I think. Wrong. These are the same manufacturer, same model, bought at the same time with the same timings; they'll run (and have run for months) just fine together. I meant when he upgrades at a later point and on his part list the RAM sticks are separately thats why I asked. It was not his personal build and I bet the institute paid for everything.